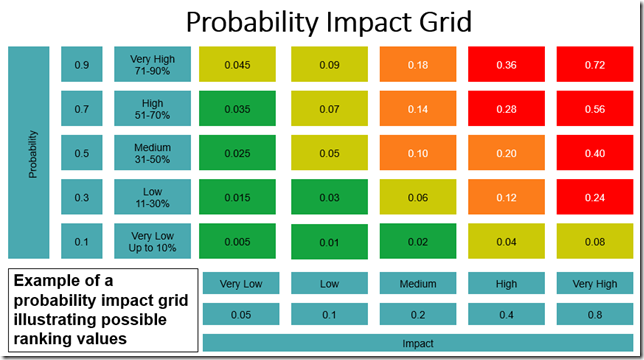 As can be seen, the probability is classed as Very Low, Low, Medium, High or Very High, and each classification has an associated value (0.1, 0.3, 0.5, 0.7, 0,9), and a similar classification, but different values, exists for the impact. 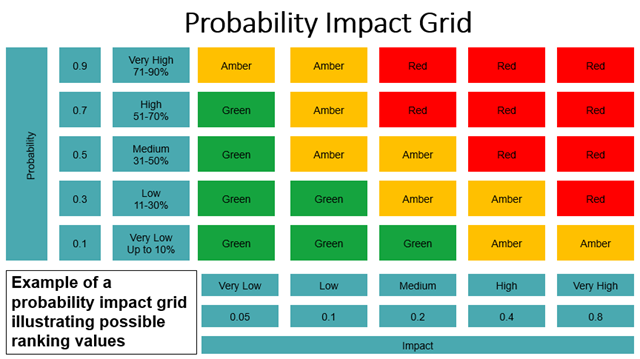 The product of the Probability and Impact is one of 25 unique values between 0.005 and 0.72. This is standard functionality in many programming languages, and because “nested ifs” can become quite complex, other code structures such as CASE statements can be used instead. So, you should now be asking the question, “It’s all interesting, but why bother with the lesson Ben?” The answer is that SharePoint doesn’t have a CASE statement, and only supports 7 nested if statements, and we need 24 to implement our solution…! A simple solution (but hardly documented) does exist because we can concatenate multiple nested ifs together using the & symbol. 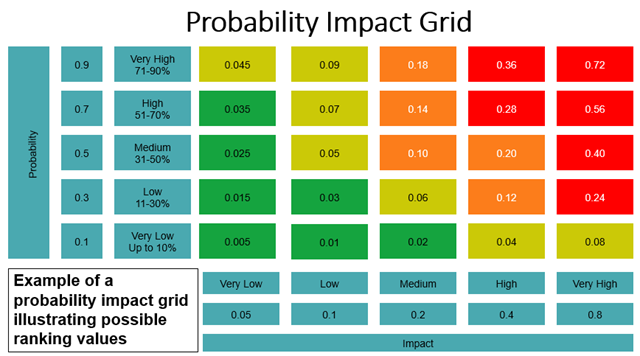 =IF(AND([Probability Selection]=”Very Low”,[Impact Selection]=”Very Low”),”0.005″, IF(AND([Probability Selection]=”Low”,[Impact Selection]=”Very Low”),”0.015″,…. You can take the above code and paste it into SharePoint, but make sure there are no hidden line breaks etc. In truth you wouldn’t need a new calculated exposure field, you could use the existing one which has the advantage that it is in the reporting database. If you wanted something slightly less complex, then rather than returning a value, you could just return a Red, Amber Green value, or even a combination of both. The grid below shows which values should be Red, Amber or Green.